This grill is exactly what I wanted. 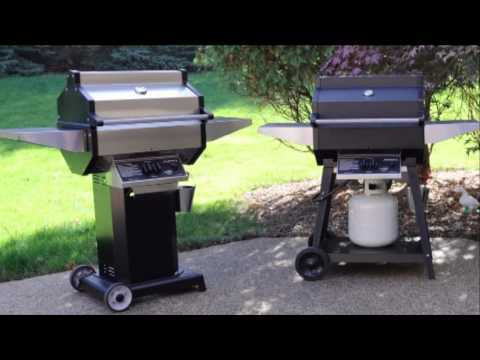 I've had every type of grill in every price range and only recently discovered that instead of a water bottle by the grill I could buy a design that eliminates flare ups and grease fires. It also excels with delicate items such as vegetables and seafood. We have had this grill for about six months, we grill maybe three times a week and here in Minnesota we do it in our garage in the winter. We open the door a little and get some cross draft to help with the smoke from grilling. 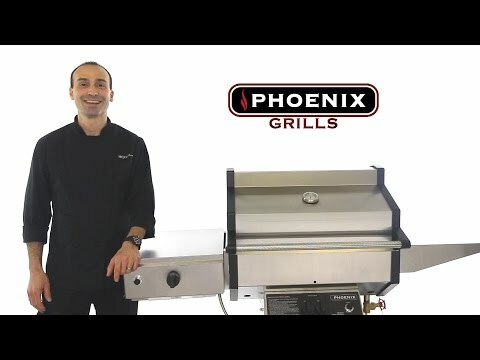 I was soooo tired of the flame up from all the other grills I have owned that I thought I would spend a few extra dollars and get the Phoenix. I got the all SS one due to the fact that it will sit out all summer. I am very pleased with this grill and wish I would have bought one years ago. The heat builds up quite fast and stays were you want it. I grill our steaks at around 300 deg. and that is held on the low setting (sometimes with just one burner). You cannot go wrong with this grill. I only have one question, they said the side trays were SS but my magnetic temperature prob will stick to them, it will not stick to the other SS on the grill. I have owned numerous grills over the years and this is by far the BEST !!!! It is far better than my Stainless Weber and Cheaper cost than a Holland. I love the NO FLARE feature !!! Buy one and you will not be disappointed !!! Grill was delivered quickly. It was securely wrapped and undamaged. Assembled by myself. Instructions good. Nuts, bolts and other pieces were above average. They recommend a socket wrench but I did not think this was really a requirement. Grill looks good, sturdy, well thought out. Venturies a little hard to access if cleaning is required. Have cooked dry and wet. Hard to get temp below 300 for wet cooking. But Produced an excellent Brisket using this method. Burgers very good as it sears better than I expected. Would definitely recommend. Good service from BBQGUYS. Grill arrived well packaged and was easy to assemble. The GOOD is that it seems to cook well as advertised. The BAD is that it is extremely over priced and has many design features that should be improved. Unlike my normal purchases of this dollar amount I purchased this grill without seeing one; only seeing on line. For the quality and what you get this is a 600.00 grill at most that is priced over 1,000.00. I keep my grill in the garage and roll it out to cook. The grill was very difficult to roll because of the cheap plastic wheels and design. I added casters on all four corners to solve this problem. I cannot blamed anyone but myself for buying this overpriced product. What are the differences between the base options? There are two base options available: black aluminum pedestal with cast iron base or stainless steel pedestal with an aluminized steel base. The stainless steel base should hold up better to the elements over the years. As far as the mounting options available. the "On-Cart" version features for small caster wheels, making easily to maneuver anytime. The "On Patio Base" features no wheels, and is best for a more permanent placement of your grill. The "On Pedestal Cart" features two large rear wheels and pedestal feet for the best of both worlds. 24 1/4 X 16 1/2" 25 13/16 X 19" 26 1/4 X 19" 25 1/2 X 19 1/4"